AUSTIN, Texas – (BUSINESS WIRE) – March 07, 2018 – Keller Williams, the world’s largest real estate franchise by agent count and the U.S. leader in units and sales volume, is partnering with Nextdoor, the trusted communications platform for neighborhoods. Through KW Labs, the innovation hub of Keller Williams, the franchise will be leveraging data insights from Nextdoor to build new experiences for homeowners, home buyers and sellers exclusively. “We’re excited to be working with Nextdoor, one of the first companies to raise their hand and say they want to plug into the Keller Cloud and give value to Keller Williams’ agents and their clients, while contractually agreeing to respect the agent, their data and their listings,” said Josh Team, chief innovation officer (CIO), Keller Williams. With Nextdoor’s insights and Keller Williams’ artificial intelligence platform Kelle, agents will be further empowered to be the local expert, staying abreast of local neighborhood happenings and trends. “From the very beginning, some of the most popular neighborhood conversations on Nextdoor have been about homes for sale and the local real estate market,” said Ali Jafari, vice president of business development, Nextdoor. “This partnership with Keller Williams gives Nextdoor members easier access to local real estate experts and millions of listings, and provides a natural way for agents to join real estate conversations in the neighborhood where they can provide true value,” said Jafari. “Imagine a KW agent being able to simply ask Kelle: ‘What do I need to know around here?’ and then being able to easily tell a client everything about that area, including trends and themes at the neighborhood level, by connecting the 170,000 Keller Williams agents with Nextdoor members,” said Team. Regarding listing treatments, Nextdoor will respect Keller Williams’ “My Listings, My Leads” philosophy. And, Nextdoor will not allow another agent to advertise on a Keller Williams’ listing. Keller Williams’ agents can also opt out of syndicating their listings to Nextdoor. Austin, Texas-based Keller Williams, the world’s largest real estate franchise by agent count, has more than 930 offices and 177,000 associates. The franchise is No. 1 in units and sales volume in the United States. In 2018, Training magazine inducted Keller Williams into its Hall of Fame of top training organizations across all industries in the world. Since 1983, Keller Williams has grown exponentially and continues to cultivate an agent-centric, education-based, technology-driven culture that rewards agents as stakeholders. The company also provides specialized agents in luxury homes, commercial, and land properties. For more information, visit kw.com. Nextdoor (nextdoor.com) is the free and private social network for neighborhoods available on Web, iOS, and Android. On Nextdoor, neighbors create private online communities where they get to know one another, ask questions, and exchange advice and recommendations. More than 165,000 neighborhoods across the United States, Germany, France, United Kingdom, and the Netherlands are using Nextdoor to build stronger and safer places to call home. 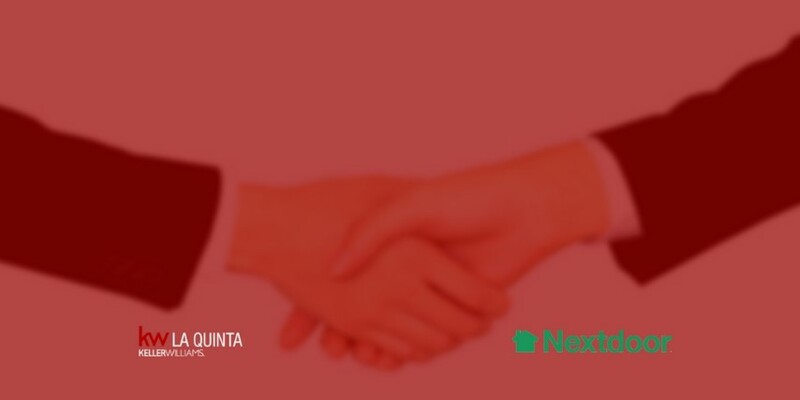 Headquartered in San Francisco, Calif., Nextdoor is a privately held company with the backing of prominent investors, including Benchmark, Greylock Partners, Tiger Global Management, Kleiner Perkins Caufield & Byers, and others. For additional information and images: nextdoor.com/newsroom. SOURCE Keller Williams Realty, Inc.